Discussion in 'How To' started by Mick West, Oct 21, 2013. Don't copy it an put it in quotation marks, or a different color, or bold. Ideally you would quote just the part of a post that is most relevant. 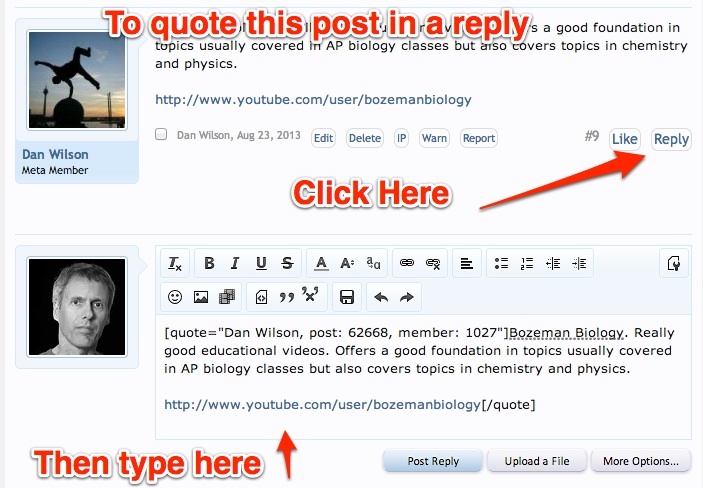 Highlight the text in the post, and a "reply" button will pop up, click on that and it will copy the text you have highlighted as a properly linked quote into the reply box. You can do this multiple times, even on different pages of the thread. The bit at the start of the quote ([quote="Mumbles, post: 71841, member: 2440"] is important, as it creates a link back to the original post, the little arrow next to the "said:"
If you don't want to quote anything at all, do not hit Reply, instead just scroll down to the empty reply box at the end of the page.